Oohh gossh look what came in the maaaail! Offer's generally open-- kynale, wishbunny, mashimizu, twocue, pirate-kay? I REALLY would love trading with you if your still open. !!! Forgot to add Nicoles XD! I loooves it! Jhey came out so pretty!! I have the rest of mine ready to mail now, they'll go out on Monday. Sorry for being so slow. This is sooo cool, thank you so much Selini, I love it!! And I'm so so sorry my crappy camera pic doesn't do it justice. 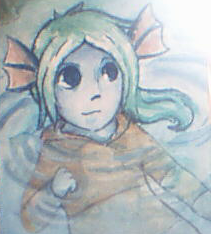 ;_; I will rescan this once I get my scanner working, along with any other cards I get. And omg I adore the doodles too, those are so perfect you have no idea. XD I'll take a pic of those too and edit them in when I'm less lazy, unless you don't want me to. But I love 'em. Thank you! Oh wow. o-o I didn't expect it to get there so fast either! I'm glad it made it though. And that's okay! Chances are yours is here... I just haven't checked the mail in a while. Dx;; I will for sure today! Anyways, you're welcome, Ky. And it's fine if you want to show the other stuff. It's not much, but I'm glad you like them. Oh and gasp! My card from Kynale came! :3!!! Heheheh all of them have been Jackie themed so far!! 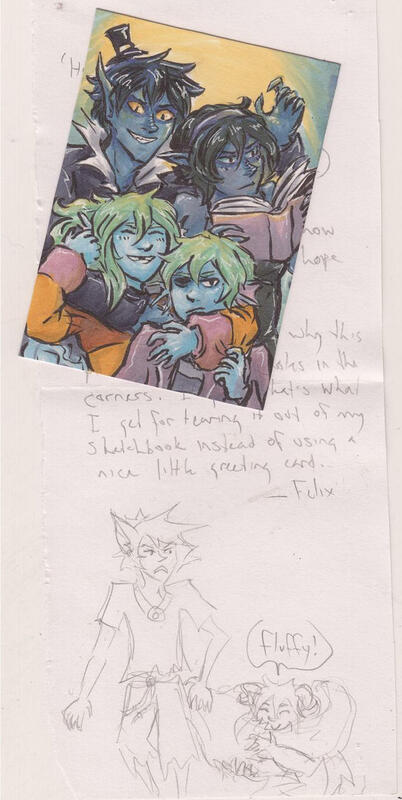 X'D And it's funny, Perdy and Delilah have been chosen twice now for the "extra doodles" in the card! And yaaay, my card from Kynale came too! >w< I'm kicking myself for not checking the mail earlier. And you even gave me an extra Kalo! ;_; Sorry, I really wanted to show this. So cute! aaahhhh so many beautiful carrddds ;3; Mine from Duskglass arrived yesterday!! Sky and Selini, I'm glad yours both made it okay! I'm all caught up with mine, and I'd love to do more, but I think I'm going to take a break for the month of November because I'm going to be pretty busy. This was so much fun though, and I hope more people will be still be open to doing this again in a month's time. It kinda makes up for not getting to actually be a participant in Secret Santa haha. And I still have more cards coming, so excited for those, yay! yeah, I might not have time for any in november either, between nano and continuing to update my comic xD;; but I'll definitely open up again in december! I really enjoy doing these. I would like to trade with EVERYONE here though ;O; I just dunno who is open. @Dusk: AWESOME! I can't wait till Dec. then so we can trade as well! !!! @Varethane: YESSSsssss! I would looovee ta trade with you as well! ^O^! I am still open for trades!! ALSO! If Wishbunny and Selini, if you guys wanna trade with me as well I would love to if your open for it! ! Oh my goodness, this looks amazing. Anyone looking for a trade? Yay, more trades. I would be happy to trade with you all. I guess I'll start with sky's and varethane's and after that I'd be glad to trade with you, Kay and twocue. ^^ And after that, maybe Elyssie? Ahhh! 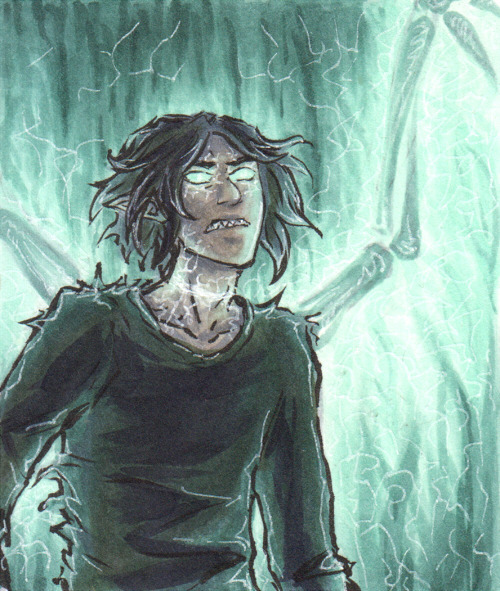 I will be happy to trade with all three of you, Two, Seli, and Thane! I dunnuh what to do next, other than ask what I should be drawing. I will post mine if you want to trade with me as well! @Selini: HEE!! AWESOME! Just let me know who you want drawn when it gets to me. ... I want to fill at LEAST a page in my trading card book. n.n! @Varethane: Also, what would you like me to draw as well? ?? ?